At this harvest time of year, many of us take moments in our day to be grateful for the many blessings in our lives. As I watch the rain fall this morning, I have many gifts for which to be thankful.Those thoughts are what inspired today's card. I made use of the rich in-colors, Hello Honey, Tangelo Twist and Blackberry Bliss. 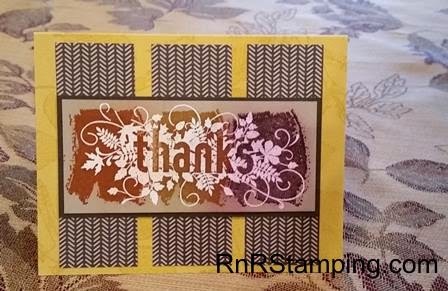 The Seasonally Scattered sentiment was heat embossed and I used the embossed resist technique with the Work of Art stamp on Crumb Cake CS. The image was framed in Early Espresso. Recognize the panels?? They come from the Trim the Tree DSP pack - it's not just for Christmas! The Hello Honey card base was stamped in Versamark with leaves from a vintage set I have. A quick and easy card to create. Don't forget to check out the deals for this week. Click on the photo to go to my 24/7 online store.